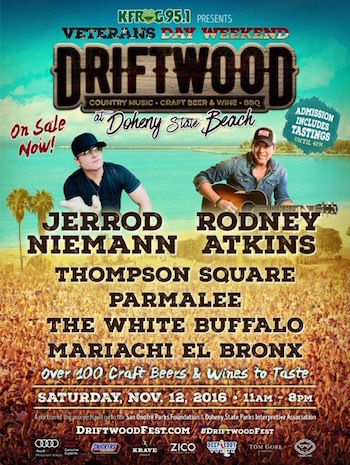 Saturday, November 12 marks the debut of KFRG presents Driftwood at Doheny State Beach, an afternoon of country music, craft beer, artisan wine and top notch BBQ at the scenic Doheny State Beach in Dana Point, CA. 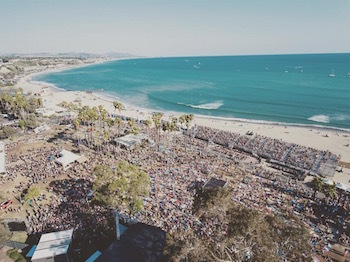 Festival attendees will roam throughout the lush grass areas of Doheny State Beach, right off the shore of the Pacific Ocean, touching the sand. Produced by premier music festival production company Synergy Global Entertainment (SGE), Orange County, California's most successful and respected craft beer festival producer Brew Ha Ha Productions, and California's new country KFRG-FM (K-Frog), Driftwood at Doheny State Beach will feature over 100 craft beers and artisan wines, some of the best BBQ in the region, as well as a full day of eclectic music ranging from country to Americana and mariachi rock, with performances from Nashville hitmaker Jerrod Niemann, along with Rodney Atkins, Thompson Square, Parmalee, The White Buffalo, and Mariachi El Bronx. Headliner Jerrod Niemann says, "Jerrod Niemann here…looking forward to hanging with y'all at Driftwood for some good laughs, some awesome music and some great California beverages!" A limited number of discount presale tickets for Driftwood at Doheny State Beach will be available from Tuesday, September 27 at 10:00 AM PT through Thursday, September 29 at 10:00 PM PT. The presale code is available by visiting the festival's Facebook page: www.facebook.com/driftwoodfestival. Regularly priced tickets go on sale on Friday, September 30 at 10:00 AM PT. Driftwood at Doheny State Beach kicks off at 12:00 PM on Saturday, November 12 (with early entry guests arriving at 11:00 AM). Tastings are included with admission, with music lasting until 8:00 PM. Festival attendees will choose from over 100 craft beers and wines to taste until 4:00 PM (for those 21 and up), and will have the chance to enjoy the best of California's BBQ. The initial list of participating breweries includes: Ballast Point (San Diego, CA), Bottle Logic Brewing (Anaheim, CA), Ninkasi (Eugene, OR), Stone Brewing Co. (San Diego, CA) and Sierra Nevada (Chico, CA), with many more to be announced. Participating wineries include: Liberated, Maggio Winery, Mark West, Rebel Coast, William Hill, and tons more to be announced. Festival co-producer Cameron Collins of Brew Ha Ha Productions explains, "Driftwood is going to be a really unique and special event! We're bringing in some of the best beer and most sought after wine in the country in addition to some of the world's best BBQ. To top it all off, we're holding it at one of California's most beautiful parks and beaches! There have been plenty of beer and wine festivals, but there has never been one like this!" Driftwood co-producer John Reese of SGE says, "We are so excited to bring south Orange County its very first all-day country music, craft beer and BBQ festival at the beautiful Doheny State Beach. We're also giving back to the San Onofre Parks Foundation and Doheny State Beach Interpretive Association with every ticket sold. So in addition to throwing a great local event in our own backyard, we are also helping to preserve our beaches, parks and coastlines, which is what it's really all about." "K-FROG is very excited about presenting the Driftwood festival at Doheny State Beach," says Steve Hay, Director of Live Events & Experiences for 95.1 KFRG-FM. "We've always been California Country, and what's more California than the beach? We're bringing an awesome country lineup from Nashville to perform right on the sand of one of our most beautiful beaches. Great country music with Pacific Coast Highway and a California beach sunset as a backdrop. It's something that's never been done before, and K-FROG is proud to be the station to do it. You don't want to miss this one!" "Driftwood at Doheny State Beach has been an idea looking for a home for a long time. We refused to launch until we found the perfect place for the country music-loving crowd. Working with California State Parks to bring another star-studded event to Doheny State Beach is a match made in heaven for Driftwood. Craft beer and wine tastings for four hours, the best BBQ that California has to offer, and HUGE country music acts, all day on the beach in the park with your toes in the sand? OK!," co-producer Heather Vantress of SGE adds. General Admission and VIP tickets will be available for purchase for the following prices. All tickets include beer and wine tasting, and access to view the music stage. In honor of Veterans Day weekend, the festival is offering a $50 discounted ticket for active and retired military. The military ticket includes Early Entry Admission, with the opportunity to enter one hour early entry to taste over 100 craft beers and wines until 4:00 PM, with music lasting until 8:00 PM. Also included is a complimentary roundtrip shuttle to and from the San Juan Capistrano area. Sponsors for KFRG presents Driftwood at Doheny State Beach include: Audi Of Mission Viejo, Snickers Crisper, Krave Jerky, Deep Eddy Vodka, Tom Gore Wines, Cosmic Fog and Lyft. KFRG (95.1 FM, "K-FROG") is a commercial country music formatted radio station in Southern California broadcasting to Riverside, San Bernardino, Los Angeles and Orange Counties. Owned by CBS Radio, its studios are in Colton, CA and the transmitter site for KFRG is north of San Bernardino. Programming on 95.1 KFRG-FM is also simulcast on 92.9 KXFG-FM in the Temecula Valley region of South Riverside County. Together, the two frequencies reach an audience of over 600,000 listeners each week.